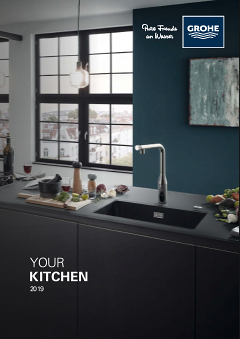 This stylish GROHE K7 kitchen tap provides professional functionality, including a spray which swivels through a full 360° and offers a choice of a fine spray and a powerful shower jet. With its impressive operating radius, filling and rinsing pots or cleaning the working surface is easier than ever, especially as it has a high swivel spout. For extra smooth and effortless handling, the single-lever mixer is crafted with our GROHE SilkMove ceramic cartridges. Finished in gleaming GROHE StarLight chrome, it will retain its pristine look even after years of intense use. It is also super quick to fit thanks to our easy installation system. K7 – a fantastic way to upgrade your kitchen!